Please note: This post contains personal recommendations and opinions and therefore is an advertisment, however, it is not sponsored. Whoever has seen the film “Hangover 2” will know this place for sure. 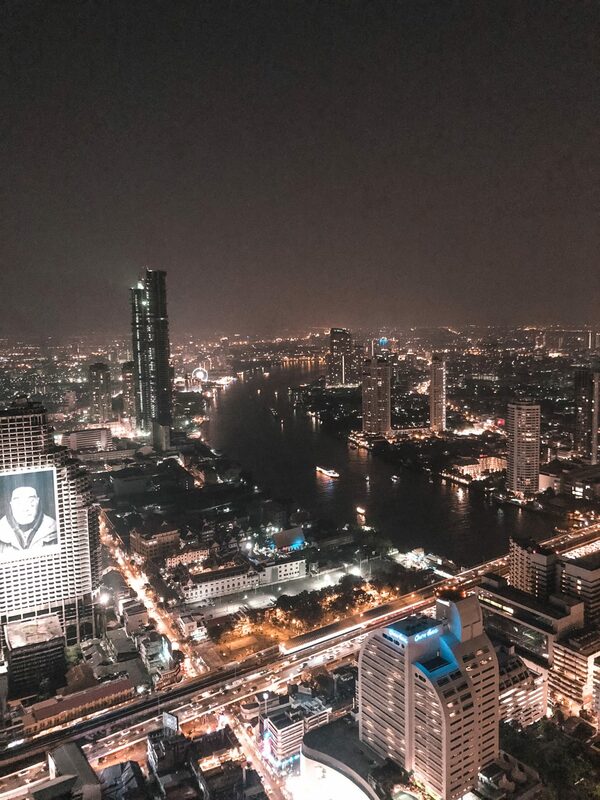 I’m talking about the most famous and highest sky bar in whole Bangkok – the Sirocco Sky Bar. This bar is located in the luxurious five star hotel Lebua State Tower and therefore is an exclusive location, so there are a few things you should know before you visit it. Depending on where your hotel is you can either walk or take a taxi to the Lebua Sky Bar. Our hotel was near the sky bar, but we had to take a taxi and it took us about half an hour because of the traffic. So plan more time to get there, especially when you want to see the sunset. The atmosphere in this hotel is simply amazing, it is quite a cool feeling when you walk the same way as the actors in “Hangover 2” have walked. Depending on how many people there are you have to wait in line for the elevator, because there are only two of them. Normally you don’t have to wait too long. The elevator brings you up to the 64th floor – yes, it sounds high and it is high! When you first walk outside to the open air sky bar it will truly take your breath away. For me it was the highest I’ve ever been in a building and therefore the view was just impressive! When you reach the bar everything you want is just enjoy the view. Tip: There is another bar on the same floor which is called Distil Bar. There you can have a seat on one of the comfortable sofas and pillows and enjoy the view even more. There’s a strict dresscode at Lebua Sky Bar. Men shouldn’t be dressed sporty or athletic and shouldn’t wear open shoes or sleeveless t-shirts. For women, beach sandals and flip flops aren’t allowed. So, what to wear exactly? Men: Long trousers (could also be a nice pair of jeans), shoes that are closed and not too sporty and a nice longsleeved shirt. We’ve seen also men that wore shorts, so I don’t know how strict this dresscode really is when it has 30 degrees. Women: It is allowed to wear sleeveless clothing such as a nice dress. It is also allowed to wear open shoes and sandals as long as they aren’t flip flops. You may think that you know what the prices are in such an exclusive and famous location – but let me tell you that you don’t know it. You would’ve never thought that the prices for the drinks in this skybar would be so damn high. You need to remind yourself that we are still in Bangkok, a city where everything is totally cheap, but the Sirocco Sky Bar manage it to pay you 780 Baht (these are 20€) for a beer that doesn’t even tastes good. So please do yourself a favor and read the drink menu carefully and convert the prices correctly into your currency before you order. With all these things in mind you can enjoy a wonderful and unfortgettable evening in Bangkok’s highest sky bar!